KHANM A, MABROUKIT, VIDAL-SALLéE, et al. Numerical and experimental analyses of woven composite reinforcement forming using a hypoelastic behaviour. Application to the double dome benchmark [J]. Journal of Materials Processing Technology, 2010, 210(2): 378-388. MACKC, TAYLORH M. The fitting of woven cloth to surfaces [J]. Journal of the Textile Institute Transactions, 1956, 47(9): T477-T488. ROBERTSONR E, HSIUEE S, SICKAFUSE N, et al. Fiber rearrangements during the molding of continuous fiber composites. I. Flat cloth to a hemisphere [J]. Polymer composites, 1981, 2(3): 126-131. WANGJ, PATONR, PAGEJ R. The draping of woven fabric preforms and prepregs for production of polymer composite components [J]. Composites Part A: Applied Science and Manufacturing, 1999, 30(6): 757-765. LAROCHED, VU-KHANHT. Forming of woven fabric composites [J]. Journal of Composite Materials, 1994, 28(18):1825-1839. LONGA C, RUDDC D. A simulation of reinforcement deformation during the production of preforms for liquid moulding processes[J]. Proceedings of the Institution of Mechanical Engineers, Part B: Journal of Engineering Manufacture, 1994, 208(4): 269-278. LUCA PDE, LEFEBUREP, PICKETTA K. Numerical and experimental investigation of some press forming parameters of two fibre reinforced thermoplastics: APC2-AS4 and PEI-CETEX [J]. Composites Part A: Applied Science and Manufacturing, 1998, 29(1): 101-110. KHANM A, MABROUKIT, VIDAL-SALLÉE, et al. Numerical and experimental analyses of woven composite reinforcement forming using a hypoelastic behaviour. Application to the double dome benchmark [J]. Journal of Materials Processing Technology, 2010, 210(2):378-388. DUHOVICM, BHATTACHARYYAD. Simulating the deformation mechanisms of knitted fabric composites[J]. Composites Part A: Applied Science & Manufacturing, 2006, 37(11):1897-1915. 堵同亮,彭雄奇,郭早阳,等. 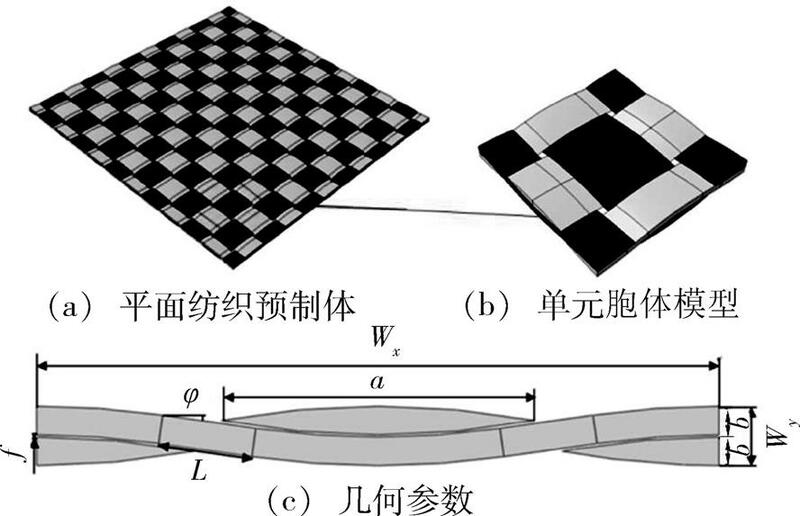 碳纤维编织复合材料冲压成形实验与仿真分析[J]. 功能材料, 2013, 44(16):2401-2405. 李阳,肇研,刘刚,等. 国产CCF300碳纤维及其NCF织物的性能[J]. 航空学报, 2014, 35(10):2889-2900. CHAKLADARN D, MANDALP, POTLURIP. Effects of inter-tow angle and tow size on carbon fibre friction [J]. Composites Part A: Applied Science & Manufacturing, 2014, 65(65):115-124. BADELP, VIDAL-SALLÉE, MAIREE, et al. Simulation and tomography analysis of textile composite reinforcement deformation at the mesoscopic scale [J]. International Journal of Material Forming, 2009, 68(12):2433-2440. BOISSEP, HAMILAN, VIDALE. 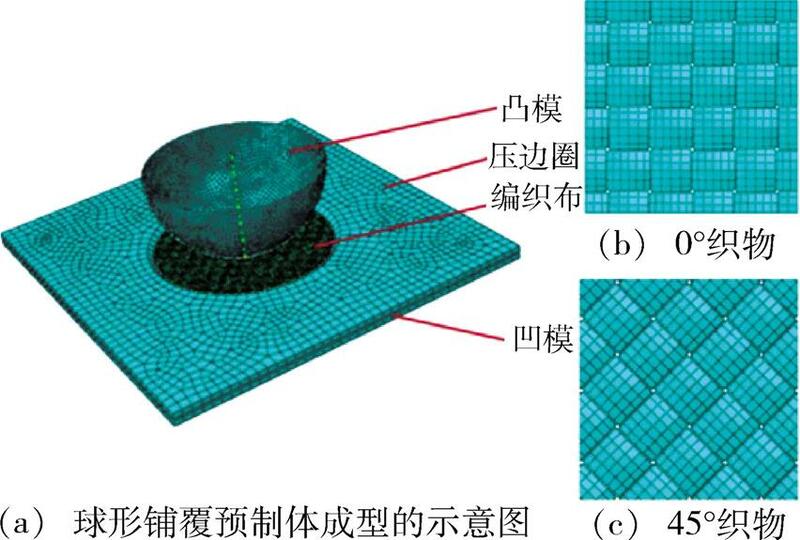 Simulation of wrinkling during textile composite reinforcement forming. Influence of tensile, in-plane shear and bending stiffnesses [J]. Composites Science & Technology, 2011, 71(5):683–692. KHAN M A, MABROUKI T, VIDAL-SALLé E, et al. Numerical and experimental analyses of woven composite reinforcement forming using a hypoelastic behaviour. Application to the double dome benchmark [J]. Journal of Materials Processing Technology, 2010, 210(2): 378-388. MACK C, TAYLOR H M. The fitting of woven cloth to surfaces [J]. Journal of the Textile Institute Transactions, 1956, 47(9): T477-T488. ROBERTSON R E, HSIUE E S, SICKAFUS E N, et al. Fiber rearrangements during the molding of continuous fiber composites. I. Flat cloth to a hemisphere [J]. Polymer composites, 1981, 2(3): 126-131. WANG J, PATON R, PAGE J R. The draping of woven fabric preforms and prepregs for production of polymer composite components [J]. Composites Part A: Applied Science and Manufacturing, 1999, 30(6): 757-765. 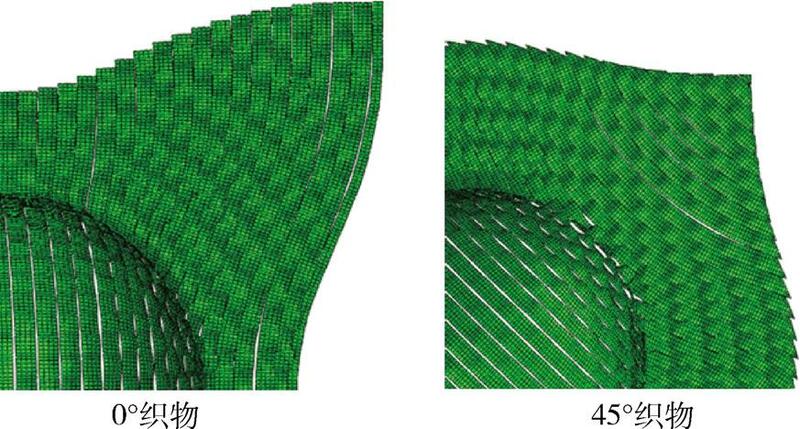 LAROCHE D, VU-KHANH T. Forming of woven fabric composites [J]. Journal of Composite Materials, 1994, 28(18):1825-1839. LONG A C, RUDD C D. A simulation of reinforcement deformation during the production of preforms for liquid moulding processes[J]. Proceedings of the Institution of Mechanical Engineers, Part B: Journal of Engineering Manufacture, 1994, 208(4): 269-278. DE LUCA P, LEFEBURE P, PICKETT A K. Numerical and experimental investigation of some press forming parameters of two fibre reinforced thermoplastics: APC2-AS4 and PEI-CETEX [J]. Composites Part A: Applied Science and Manufacturing, 1998, 29(1): 101-110. KHAN M A, MABROUKI T, VIDAL-SALLÉ E, et al. Numerical and experimental analyses of woven composite reinforcement forming using a hypoelastic behaviour. Application to the double dome benchmark [J]. Journal of Materials Processing Technology, 2010, 210(2):378-388. DUHOVIC M, BHATTACHARYYA D. Simulating the deformation mechanisms of knitted fabric composites[J]. Composites Part A: Applied Science & Manufacturing, 2006, 37(11):1897-1915. CHAKLADAR N D, MANDAL P, POTLURI P. Effects of inter-tow angle and tow size on carbon fibre friction [J]. Composites Part A: Applied Science & Manufacturing, 2014, 65(65):115-124. BADEL P, VIDAL-SALLÉ E, MAIRE E, et al. Simulation and tomography analysis of textile composite reinforcement deformation at the mesoscopic scale [J]. International Journal of Material Forming, 2009, 68(12):2433-2440. BOISSE P, HAMILA N, VIDAL E. Simulation of wrinkling during textile composite reinforcement forming. Influence of tensile, in-plane shear and bending stiffnesses [J]. Composites Science & Technology, 2011, 71(5):683–692. 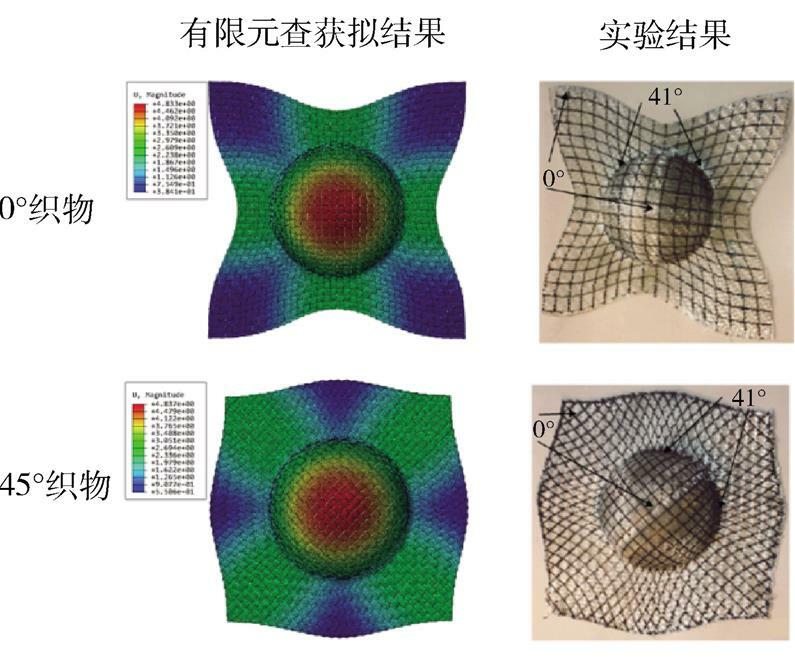 WANG Bo,LI Ang,YANG Zhenyu.Numerical Simulations on Draping of Woven Composites Preforms[J].Aerospace Materials & Technology,2019,49(02):19-23.